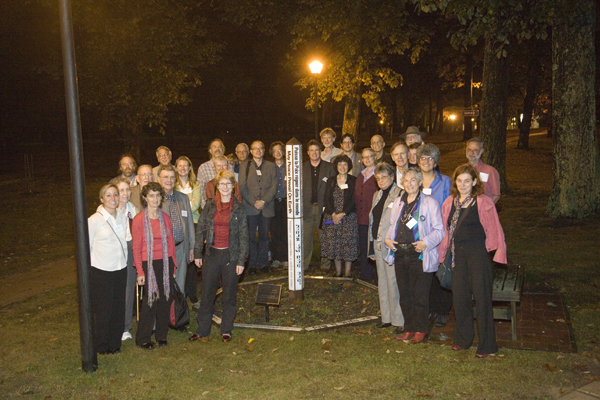 Georgian Court University, Lakewood, NJ, U.S.A.
Attendees at the PHS conference gather at Georgian Court University's Peace Pole. The PEACE HISTORY SOCIETY invites paper proposals for its fifth international conference that focus on the interrelationships between gender and war, peace and justice. From Aristophanes' comedy Lysistrata, a comedic example of Greek women using nonviolent direct action to stop the Peloponnesian War, to contemporary debates on the war on terrorism, matters of war, peace and justice have had a gendered dimension. This conference seeks to shed light on the nexus of gender, war, peace and justice. We are most interested in papers that take a historical approach to this topic. We welcome panel and paper proposals that compare different historical periods and geographies as well as those that focus on a particular event, place or time-period. Paper proposals about peace history not related to the conference theme will also be considered. The Peace History society is unable to provide travel assistance or financial support to conference attendees. Strong conference papers will be given consideration for publication in a special issue of the journal Peace& Change to be co-edited by the program co-chairs. For more information on the PHS and for conference updates, visit the PHS website, at www.peacehistorysociety.org.